This package is priced as a single cd but it comes as a 2cd + 1dvd special package! 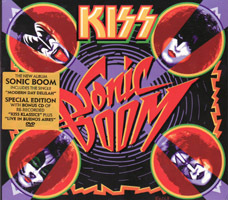 You get both the new KISS album Sonic Boom and a greatest hits cd KISS Klassics with 15 re-recorded tracks from 2007. On top of that you get a dvd with 6 songs recorded live in Buenos Aires in 2009. You think that sound like a bargain, right? Well, it is. The new album is trademark KISS and pretty good actually. It's not very hard-rock, so don't expect a new Lick It Up. But less than that is okay too. It has great pop-rock songs and a good production. The album with re-recorded songs is great too. Many of the songs are not very different from their original versions, but it sounds very consistent and makes for a fine greatest hits tour through KISS history. The dvd is worth watching as well. The argentinian crowd is unbelievable. On many songs they simply take over the show from Gene Simmons, Paul Stanley and co. Must be some of the most dedicated fans in the world. The danish KISS army can go home and KISS their own asses in comparison, that's for sure. Bottom line: if you liked KISS, then you'll like this release. No doubt about it.